RANGOON—Burma has agreed to allow observers from Southeast Asian countries to monitor April elections that are viewed as crucial for gauging the nation's much-heralded democratic reforms, the regional bloc said on Tuesday. Allowing outside monitors is a major step for the long-isolated country, which rejected international bids to observe its last two elections, in 2010 and 1990. Burma's decision was announced by the 10-member Association of Southeast Asian Nations (Asean). The bloc's statement said Burma invited Asean to send five observers and 18 parliamentarians—two from each neighboring country—to witness the vote, along with media representatives. After nearly half-a-century of iron-fisted military rule in Burma, also known as Myanmar, a nominally civilian government took office last March. The new government has surprised even some of the country's toughest critics by releasing hundreds of political prisoners, increasing media freedoms and allowing opposition leader Aung San Suu Kyi, the Nobel Peace laureate and longtime political prisoner, to run for a seat in Parliament. The April by-election is being held to fill 48 parliamentary seats vacated by lawmakers who were appointed to the cabinet and other posts. The US, European Union and United Nations have called the polls “a key test” of the government's commitment to reforms. American officials have singled out the April polls as a measure of whether the West will lift sanctions imposed on Myanmar during the military junta's rule. 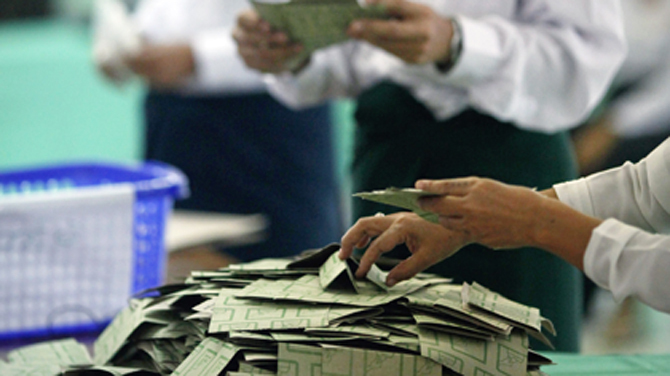 The Myanmar government made no official comment about welcoming election monitors. Tuesday's evening news on state-run television, where official announcements are generally made, did not mention the development. The top story was about President Thein Sein's official visits to Vietnam, Cambodia and Laos, all Asean countries. Asean also includes Brunei, Indonesia, Malaysia, the Philippines, Singapore and Thailand. Hey, DON'T JUMP the GUN YET guys! Thein Sein's USDP is on a course of VOTE RIGGING (CHEATING) already lest you guys forget. APRIL FOOL'S DAY ELECTIONS would be NO MORE FAIRER,JUST nor CLEANER than the November 7, 2011 polls as well trust me. And 48 seats in Thein Sein's whore house parliament is NO BIG DEAL nor HELP for Daw Suu to MAKE RULE of LAW REIGN SUPREME in Burma much less CORRECT CORRUPTION in Than Shwe's land presently run by his lackey Thein Sein today. Hence, Daw Suu should CALL OFF THE ELECTION NOW and OPT for ANOTHER SHOW DOWN in 2015 instead I say. And LET'S SEE HOW Thein Sein RUNS his SHOW WITHOUT DAW SUU in TOW. Daw Suu should LEAVE the TIGER (Thein Sein) TO ROT in the HOLE (pit) like Maung Po did for the BETTER lest she forgets. Asean countrie have to think and responsibility about oppressed and stateless ROHINGYA the muslim minorities grour in Arakan state @rakhine state. now 2 milion migrin arond the world so ever and what kind of democrecy becoming in Burma @Myanmar....? Asean have to moral and fowing the international low abou the ethnic in Myanmar. thankfull. Let the Big ROB begin? These observers should at forehand reject all the votes that were not cast on that day. There are too many reports of coercive voting. The Burmese government realise that they are suffering under the hands of international sanctions. They should also allow and welcome the US, Europe and United Nations to be observers for the by-election if they truely believe that sanctions are affecting them, the country and its economy. Since Burma is emerging towards the democratic state allowing Asean observer to monitor coming April1st by election is a good sign. The bad sign is that USDP party thugs are playing dirty trick is un acceptable and not fair also violate election law how the authority will consider is a question. Any way the voters should not afraid any sort of threatening and vote for whom their own choice. If USDP party does not want to construct roads and bridges does not matter some one will come and do it later. USDP is rully party using many kinds of tricks and power under disguise which is also against the election law, the election commission sould take action against them.